Do you struggle to come up with content ideas for all the different platforms and mediums out there? I know it can feel pretty overwhelming at times but I want you to know that you don’t have to use different content for each platform. Let’s say you have your blog and you use just two social channels every day of the week. That means you’d need 15 content ideas PER WEEK! That’s 780 PER YEAR!!! I’m here to tell you that content doesn’t have to be that difficult. The key to not losing your marbles over it is repurposing. You’d be tearing your hair out pretty quickly but I see people trying to do it over and over again. That’s when it all starts to get overwhelming and often they just give up. But content is powerful and shouldn’t be cast aside. I’m here to tell you that it doesn’t have to be that difficult. The key to not losing your marbles over it is repurposing… EVERYTHING! Just because you’ve covered a topic on your blog doesn’t mean you need to think of new ideas for social that week. You’ve already hit upon a great idea, so make sure you use that as much as you can and make it work hard for you. There are other options such as interviews, guest blogging, e-books, courses etc. 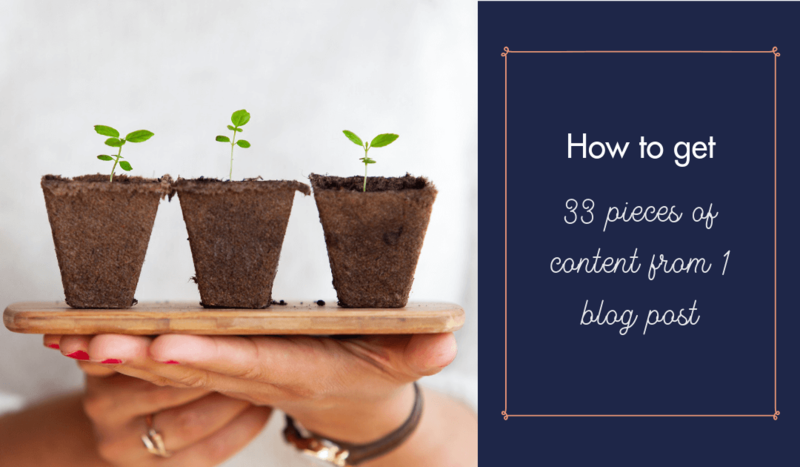 but even at this simple level, you could get 33 pieces of content from just ONE blog post. Please, please, please don’t ever use a content idea just once. As a bare minimum, use each blog, video or podcast as the inspiration for your social posts every week. I’m not for one second suggesting you need to create all 33 of these options for every blog post you publish. I know you’d rather be following your creative passion or hanging out with family and friends. But, as a bare minimum, using each blog, video or podcast as the inspiration for your social posts every week will save you a lot of time. Even if each idea only took you 10 minutes to think of and produce; by repurposing one piece of content for social, you’ll save over two hours each week, because you’re not trying to come up with 14 brand new ideas, you only had to think of one. Consistently finding ideas for content is probably the most common problem that people mention to me, but it’s usually because they’re putting themselves under way too much pressure. My advice is always the same – strip things back, make it simpler and REPURPOSE EVERYTHING! These conversations led me to put together a free PDF download of 20 easy-to-use content ideas (you can get access here) but using the suggestions I’ve made above, it has the potential to translate in to 660 pieces of content!! So please promise me, from now on, you’ll aim to repurpose everything you publish, into at least TWO more pieces of content. If you'd like to master content marketing for your creative business, book in for a FREE discovery call now! How much does content marketing coaching and planning cost?